Anytime two perennial losers meet with a World Series bid on the line, it leads to some interesting parallels. Here’s one: since meeting in the 1985 ALCS 30 years ago, the Toronto Blue Jays and Kansas City Royals have combined for a whopping 3 trips to the Fall Classic. In the last 20 years? That number dwindles to just 1—the Royals last season. So perhaps the best thing we can say about this year’s ALCS is: they can’t both lose. With that perpetually optimistic intro, let’s break down this years ALCS . To the Tale of the Tape! Kansas City: The Royals rotation was never viewed as one of this teams strengths, and in an opening round victory over Houston, they pitched to form. Ranking just 24th in quality starts during the regular season, the trio of Johnny Cueto, Edinson Volquez, and Yordano Ventura combined to allow 15 earned runs in 26.2 innings of work, with Cueto’s game 5 gem—easily the biggest start of his career—serving as the lone bright spot. Either Chris Young or Kris Medlen will likely join the rotation in the ALCS and attempt to shut down a powerful Jays lineup. Toronto: With the miraculous recovery of Marcus Stroman, the Jays have a solid rotation. Post All-Star break, Toronto pitched to a 3.33 team ERA—2nd in all of baseball over that time. Stroman, Dickey, and Estrada were all solid in the ALDS, David Price, however, was not. Verdict: Jays. Toronto just has less question marks, assuming David Price betters his career 5.04 postseason ERA (can he really continue to be that bad?). 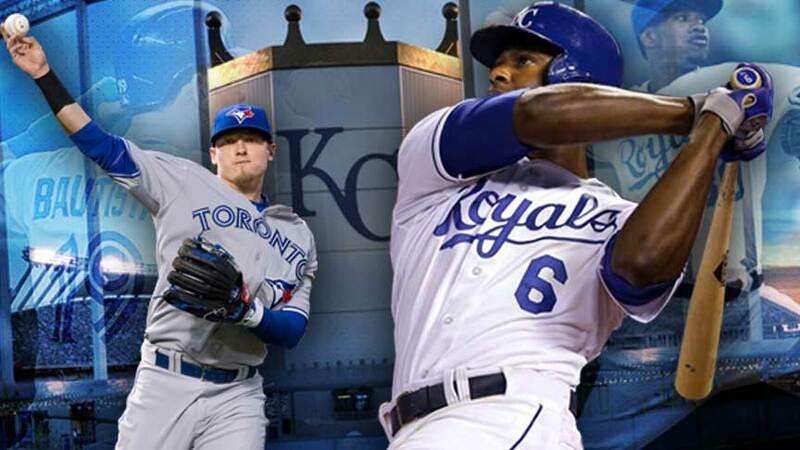 The Jays have several starters that can provide length, while the Royals saw their guys get battered in the ALDS. Kansas City: Even without Greg Holland, this is still a very formidable pen. Wade Davis has quietly been the best reliever in baseball the last 2 seasons, Kelvin Herrera took a step back in the regular season but was excellent last October, and you could do much worse than Ryan Madson and Luke Hochevar as your 3rd and 4th men out of the bullpen. They’re short on lefties, but against righty-laden Toronto, that shouldn’t matter much. Toronto: Losing Brett Cecil for the remainder of the postseason leaves the Jays vulnerable at the back end. Not only was Cecil their best lefty, but he served as their setup man as well. Now the likes of Mark Lowe, Liam Hendriks, and the ancient one, LaTroy Hawkins, will need to step up. Aaron Loup did the job against lefties in the ALDS, and will likely see Eric Hosmer in a big spot at some point. Roberto Osuna has been a revelation, but he wasn’t even born the last time the Jays made the playoffs. Verdict: Kansas City by a landslide. The Royals have the horses and the track record at the back end of the bullpen, while relievers could be an Achilles heel for Toronto against a Royals team prone to dramatic late comebacks. Kansas City: Any lineup that features Alex Gordon hitting 8th has some depth, and sure enough, this is a very strong, young lineup, capable of hitting both lefties and righties. The Royals finished 3rd in batting average and 7th in runs, and followed that up by scoring 5 runs per game in the ALDS. Toronto: Hands down the most intimidating lineup in baseball. The Jays hit a ridiculous .274 with 117 home runs in 71 games after the All-star break. They lead the league in runs by over 100. Live by the homer, die by the homer, but the Jays have been living large. Verdict: Kansas City has a good lineup, but the Jays have an All-star team. Their reliance on the long ball is a little worrisome, as often homer-heavy teams struggle in the playoffs, but it hasn’t stopped them yet. Who is really going to bet against them now? Kansas City: Above average at every position. Gordon and Cain are two of the best in the outfield. Alex Rios is aging but still has a strong arm. Toronto: Kevin Pillar is a stud in center field, while Josh Donaldson is Gold Glove caliber at third. The rest of the team is average or better. Verdict: Push. In a bizarre twist, the Jays and Royals actually finished the season with the exact same amount of errors (88), and the same fielding percentage (.985). Toronto led the league in defensive efficiency rating (.708), but KC was just percentages points behind at .704. Both teams are very strong in the field. Kansas City: This is Ned Yost’s second consecutive trip to the ALCS. Yost has overseen a revitalization of one of the sports perennial losers the last three seasons, finishing over .500 three years in a row and taking the one-time laughingstock Royals to the World Series last year. Toronto: John Gibbons is in his second stint as manger of the Blue Jays, which is rare enough these days. Even stranger is that the man he took over for this time—John Farrell—was essentially traded to the Red Sox, where he then won a World Series. Gibbons has done a solid job, but his bizarre decision to use David Price out of the bullpen with a 6 run lead in game 4 of the ALDS still boggles the mind. Verdict: Yost and the Royals by a nose, based on experience. This is Gibbons’ first trip to the postseason. That being said, it’s only the second time for Yost too. You could easily argue both teams are lucky to be here. The Royals were down 4 runs in the 8th inning of game 4 on the road facing elimination against Houston and rallied, and Toronto used Texas’s defensive implosion in the 7th inning of Game 5 to springboard themselves to victory, but regardless, they’ve both made it. Toronto’s stronger starting pitching and unparalleled lineup will propel them to victory. Kansas City surrendered 9 homers to Houston in the ALDS—that’s a problem. The Jays lineup is more potent, and makes contact much more often than the strikeout-prone Astros. The Royals starters will struggle to go 6 and hand the ball to the bullpen, which has long been their plan. Toronto’s pen is worrisome, but if Price rounds into form and Stroman continues to cement his status as a future ace, they’ll weather the storm. So get your French fries and gravy with a nice cold mug of Molson’s ready for the Fall Classic. « Previous Article Is Theo Epstein the GOAT?